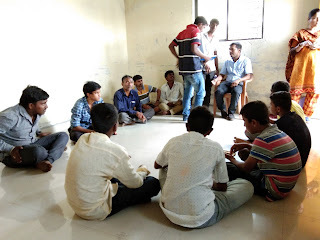 16-May-2018, Chinchwad (Pune): The Don Bosco Development Society (DBDS), Chinchwad organized an interactive awareness session on ‘Harmful Effects of Tobacco and Gutkha Chewing’ for the youth in Vidya Nagar slum in Chinchwad. 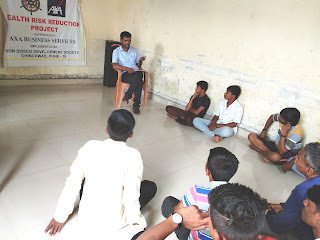 23 youth participated in this event held under the aegis of ‘Health Risk Reduction’ project supported by AXA Business Services Ltd.
Mrs. Vibhwari Kamble (Social worker - DBDS) explained the project objectives to the participants and also introduced the resource person to the participants. 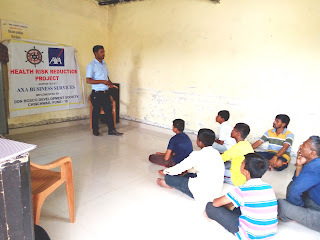 Mr. Sukhdev Ahire (Don Bosco – Social worker) was the resource person for this session. 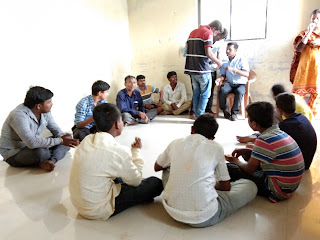 The objective of this workshop was to educate youth on harmful effects of tobacco and motivate them towards its cessation. Mr. Sukhdev Ahire covered various topics such as tobacco plant, its extraction, composition of tobacco, forms of tobacco, harmful effects on body and mind, oral cancer, lung cancer and many more health problems associated with it. 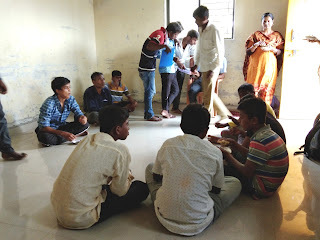 The participants asked many questions which were answered by the resource person. Snacks were served to all after the session. Mrs. Rajshree Deshkhaire (DBDS- staff) proposed the vote of thanks at the end of program.